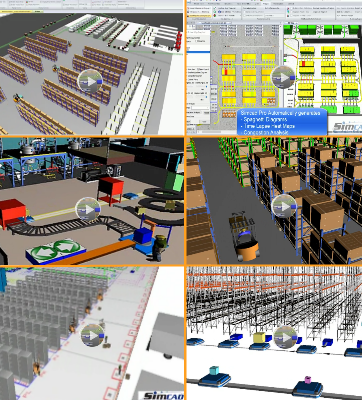 Warehouse Simulation Software, using Simcad warehouse simulator, companies proactively optimize their distribution centers by improving order picking, receiving, slotting, put away and replenishment. Moreover, by optimizing picking schedules, man power and equipment optimization can be achieved. Warehouse simulation can also help in analyzing the impact of future growth on the warehouse and help in identifying potential capacity constraints. Warehouse optimization is easily controlled and What-if analysis can be used to determine potential impact of new flows and equipment on the operation. Simcad Pro® 13.2 now supports the Oculus@ Virtual Reality glasses with fully animated 3D view of the operation. 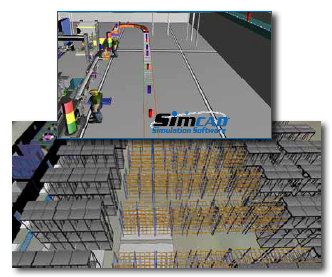 Simcad warehouse simulation software allows for model changes to be applied in real-time to the VR world. The VR view is dynamically generated based on model progress, with live changes and analysis. Import your current inventory by SKU and Location. Import or generate pick sequences, put away and replenishment. Let the model run, A heat map is generated based on user defined limits. Import locations, SKUs, and constraints. Applies to new and existing warehouses. Slot based on velocity, congestion, weight, dimensions and more. Prioritize your location by strike zones, preferred pick locations, and elevation constraints. Organize by product type, category or manufacturer. 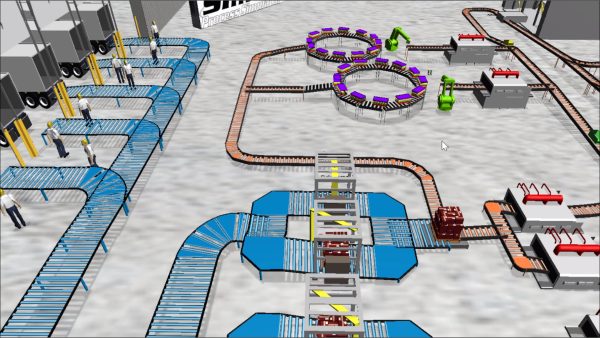 Generate optimized Re-slotting movement sequences and Work Instructions. Full support for AGV, tuggers, conveyors, robots, material handling equipment, including physics and detailed motion/ kinematics. Interactive Dynamic Simulation integration. Build, Validate, Analyze on-the-fly. Define Accurate Model Behavior in a no-code environment and Graphical User Interface does not generate code. Multi layer models and process grouping. Slotting, Picking, Receiving Analysis & Optimization. Point and click interfaces and 2D / 3D animation make Simcad Pro Warehouse the most powerful "all-in-one" package to design, optimize, visualize, and analyze without coding. Unlimited model layering, on-the-fly dynamic interaction with point and click user interface. Optimize overall warehouse efficiency with on-the-fly dynamic simulation including integrated bottleneck and constraint identification. 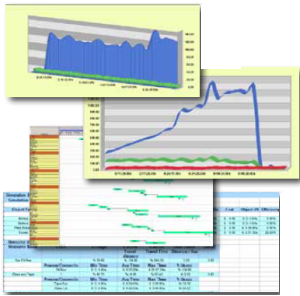 Extensive Lean analysis including dynamic value stream mapping, spaghetti diagram, efficiency reports, man power analysis, costing, shifts, and schedule detail for any warehouse solutions. CAD layout support with distance extraction and automatic animation. Replay the tracked data just like a DVR. Rewind the clock and view the activities as they occurred. Switch SimTrack Health to simulation mode and use the replay feature to optimize and improve the flow using the integrated Simcad Process Simulator. 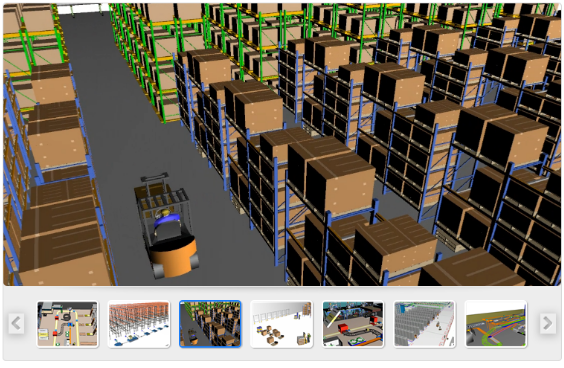 View tracked items in realtime in 2D or 3D. Hover over an item to display a quick summary, or click the item to display detailed tracking information and properties. Accurately predict the future of the operation using live data feeds, Dynamic Simulation®, and historical trends. Display the forecasted state on web enabled dashboards for increased visibility.